For several months I knitted blankets for children. I followed a simple pattern which, before long, I had committed to memory. Stitch after stitch, row after row the colorful blankets emerged - a peaceful rhythm. 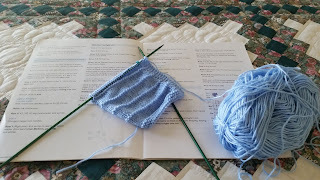 Then a sweet little grandson made his appearance, and I began work on a baby sweater. I chose a soft, light yarn - just right for a baby but so difficult to work with. If I didn't handle my work with care, the needles slipped right through, leaving me with an empty knitting needle and stitches to pick up. Unlike the pattern for small blankets, this one ran on for several pages with much counting of stitches, keeping track of rows, decreasing for armholes and the crafting of buttonholes. Not to mention sewing the pieces together. When I began, I made the mistake of reading through the pattern first. I felt discouraged before I even cast on the first stitch. It looked complicated and confusing. I felt I had bitten off more than I could chew! However, I had invested in the yarn and decided I should give it a try. I read the first sentence, cast on the required amount of stitches and knitted the first row. I continued to work the pattern one step at a time and made a startling discovery. If I didn't look ahead but instead just did the next thing the directions told me to do, it no longer seemed complicated or confusing. One small step at a time the little back of a baby sweater began to form. All I needed was enough trust in the one who had written the directions and designed the pattern to simply follow. I'm over at Laced With Grace today. Please join me there.